The Gorun Forza is the first supportive shoe from Skechers which came out a few months ago. I think they are a great addition to an already excellent range as they now have something for everyone. As a bit of background; I have been running in Skechers for about 4 years. 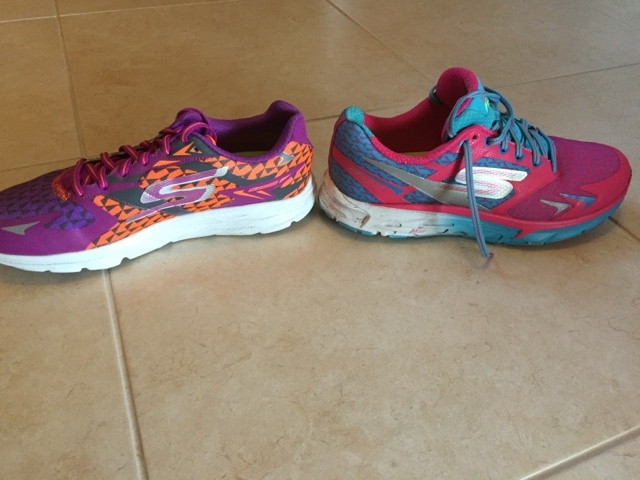 My go to shoe is the Gorun ride but for races/speedwork I use the lighter Gorun. 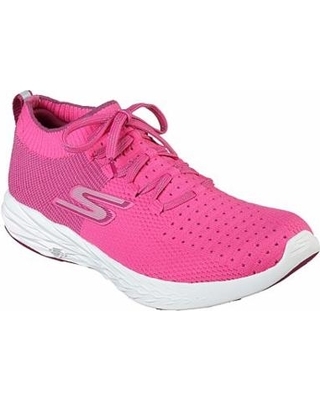 Like a lot of skechers shoes they are very pretty and have a good selection of colours. It was the colours that first attracted me to them - pink and blue; what's not to like?! The heel drop is 8mm which is more than the 4mm I am used to but less than a lot of standard shoes (the sort I used to wear!). 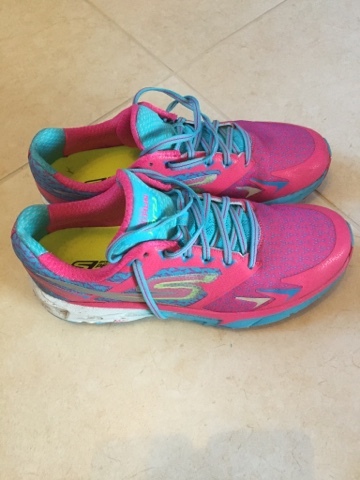 They weigh in at 280g for ladies size 7 (the gorun ride is 230g) which is about average for a non racing shoe. 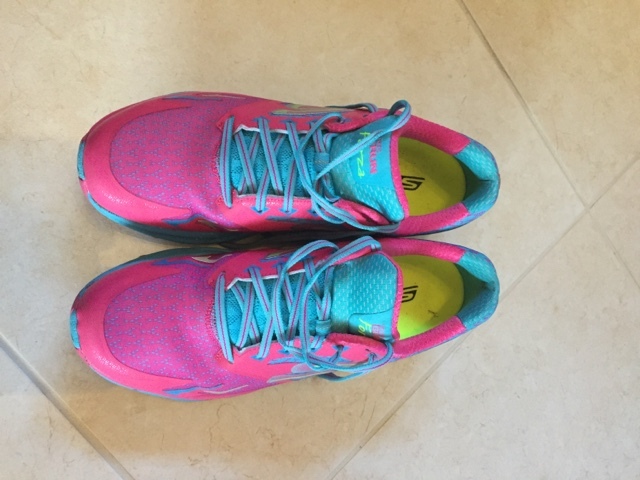 Apart from the heel which has a looser more cushioned fit the rest is very similar to the gorun ride with a nice wide toes box (which I think is the reason I hardly ever get blisters). Gorun ride 5 is on the left of this picture for comparison. As I have quite narrow feet I had to use the extra lace hole as they were too loose (more so than the other models) around the heel - using the extra hole solved that issue. I found them comfy to walk around in as the material is very soft but initially did not like them as much to run in - I think this is due to the extra weight and higher heel but also because they are quite different to my ususl show. I could certainly feel that there was some support offered which felt a bit strange to begin with but now I am used to it. It was a bit like when you drive a new car for the first time; some things take some getting used to. 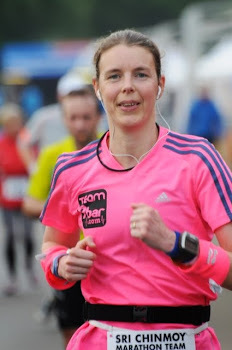 Having worn them for a number of different sessions I am liking them but still prefer the Gorun ride for training. I would not use them for speedwork/racing as they feel too heavy for me. However, for easy recovery runs I prefer them to the Go run ultra as they are not as big so I don't kick my ankle bone when tired like with the ultras! If you are looking for a supportive shoe then I would recommend them for sure. If you don't need a supportive shoe but find the other models a bit too light then again I would defiantly recommend them. I was a bit worried about wearing them to begin with as many years ago I bought a pair of supportive shoes because they were pretty but after an hour I had a really painful knee because I didn't need the support. That did not happen with the Forza which suggests the support is not too much for those who don't really need it and they could be a good marathon/ultra shoe if you need more cushioning.